Cracker Jack and I are going to leave by 7am, which turns into 10:30am because I keep needing to eat things – chicken wings, muffins, coffee, Pop Tarts. Even still, we manage to do 20 miles. We pass incredible views of Mt. Rainier. I have a deep love of this mountain. It is home. I see it from Seattle, but the view is often bounded by bridges and electric bus wires. 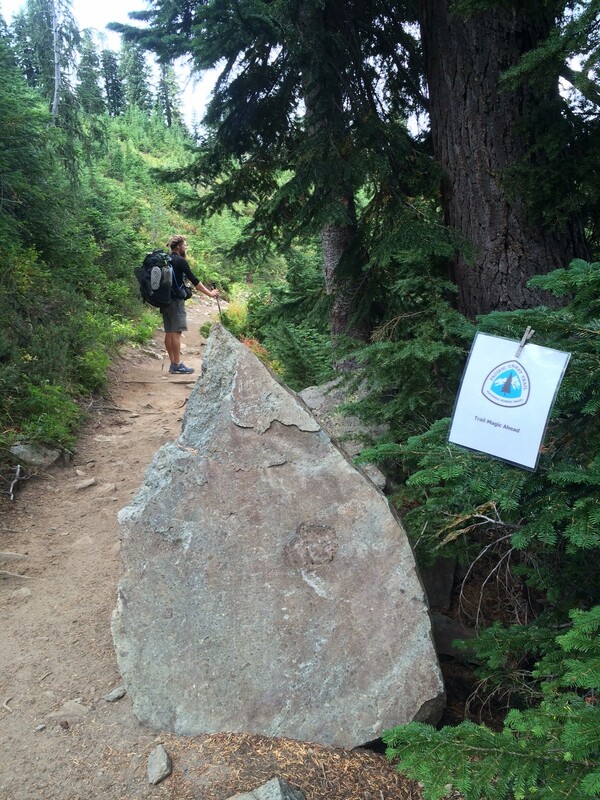 Last year, I hiked the Wonderland Trail that circumscribes it. It rained nearly every day, so I never actually had a view then either. Finally, I’m getting to see it! 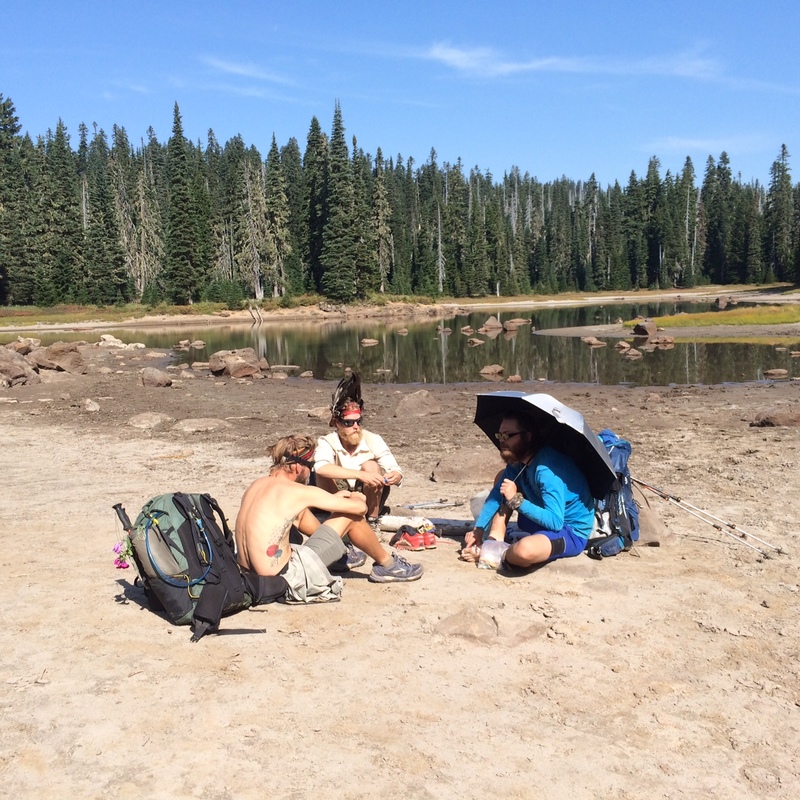 We camp near Switch by a shallow pond. 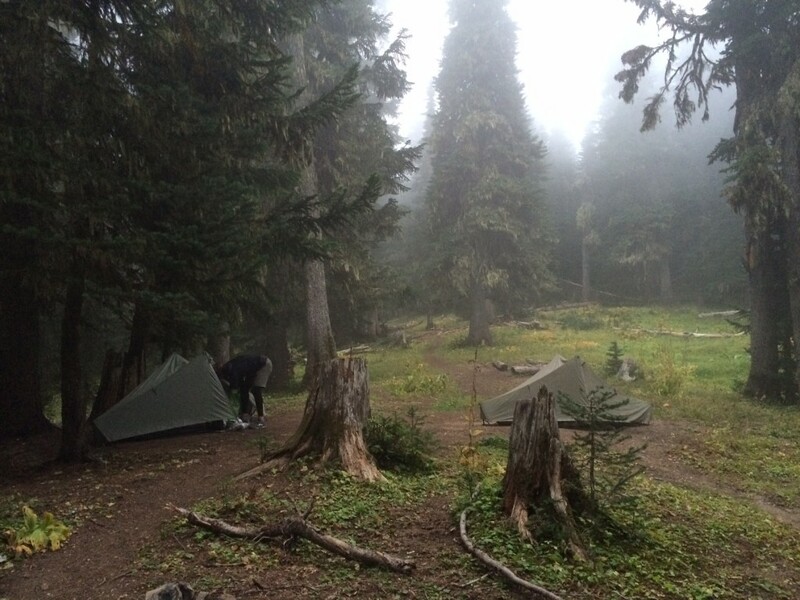 In the morning, we look at our maps and decide to have second breakfast at the Chinook Pass trailhead parking lot. As we approach, we see a sign for trail magic. We get to a parking lot and meet Tutu and Bear who have been stationed there for a couple of weeks giving treats to hikers. They offer us coffee, cans of V8, muffins and good company for second breakfast. Gizmo, Dirtnap and Switch show up too. We deeply thank our angels and head back to the trail. The elevation and the shorter days mean it’s more difficult to do the kind of miles we want to. We end up hiking the last hours by headlamp. The morning is misty. We pack up our damp things and hit the trail. By mid-morning, it’s full-on raining. I spend a number of miles trying to find the optimal balance between clothes and rain gear. The interior seems just as wet as the exterior. When I stop, I get chilled. My day is a series of costume changes. Mid-day, I find a magical dry patch underneath a large tree. I take my shoes and socks off, take my rain jacket off and put my (synthetic) puff on. I make some soup and tea, warm up, dress, repack, and start hiking again. By 8pm, I’m happy to find Cracker Jack, Gizmo, Dirtnap, Tin Tin and Smokey camped on a hillside. I join them, set up my tent, and fall asleep to the patter of raindrops. 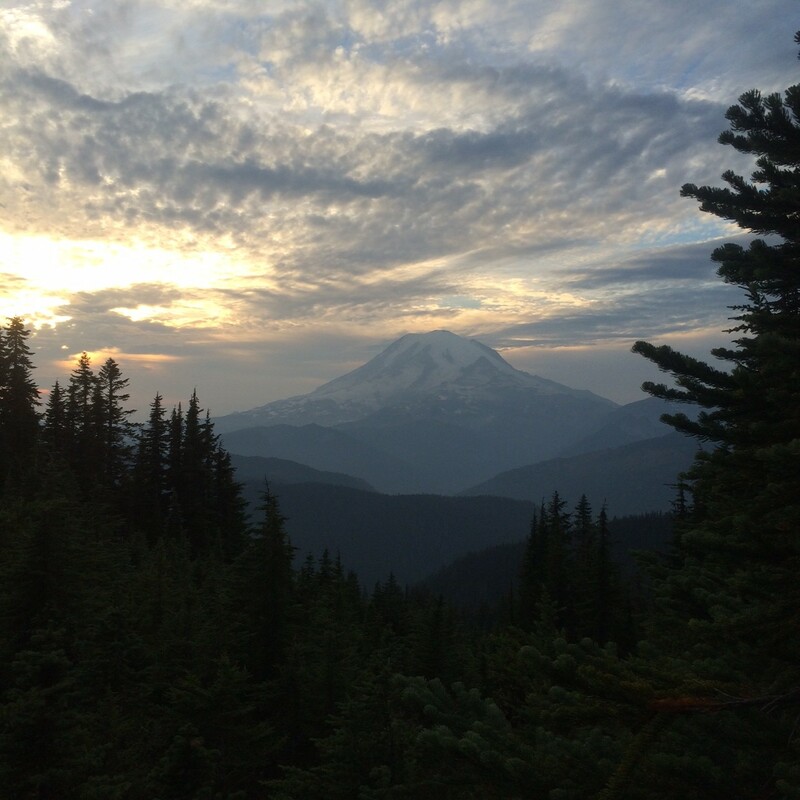 This entry was posted in Transmissions and tagged bear, cracker jack, dirtnap, elevation, gizmo, Hike, mist, mount rainier, PCT, rain, smokey, switch, tin tin, trail angels, trail journal, trail magic, tutu, Washington. Bookmark the permalink.